I never lower any truck for off roading it reduces ground clearance and reduces traction because on uneven terrain there is less chance of 4 wheels been on the earth. To be honest next time I go off road I was going to try lowering the Sandking setting by setting to see if it reduces the bounce. Even at the lowest setting it should still have plenty of clearance for most stuff however until I try, I won't really know. I added you. Really would like to get into one of these with you if I can manage to be online when you all are. Just upgraded my garage with a ton of off-road vehicles so I should be ready for anything. In a non scientific test, I lowered the sandking suspension to the lowest to see how it handles on the rough stuff. It does seem to bounce around less but the pay off is definitely a loss of ground clearance. My first attempt at a off-road style emblem that fit the theme of my rig... What you guys think? Id be keen to join in next time too if time zones allow it. Is there a reason you guys don't use a race to do these meetups? I have a lot of off road "races" in a playlist I normally just cruise around these on my own lol. This way you can respawn when stuck or damaged, and it doesn't cost you insurance. (and you get xp and $$ for them too) There is no rush to finish if your just doing it to have fun so $$$ is just a bonus. 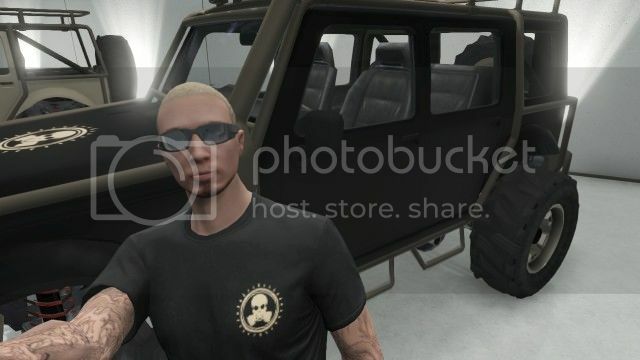 Anyone online in 6 hours or so hit me up with a PM if your keen to do some "4x4 tours"
Content Creator races don't let us take pictures which is why we do these in freeroam. Of course, races could be an option for those that want a challenge at the end of the meet. Also, checkpoints need to be close to one another or else when you spawn back you're a good distance out. Steve, if you got too many new faces you can give my spot up for the next one (whenever that is). What about a "GTA race"? I think you can take photos, ill check tonight all the offroad vids on youtube they use races so I just wondered why. I do get what you mean about the check point thing however its pretty easy to catch up to the group if its just a slow paced cruise, anyway your meets look great so don't mind me lol. Im just thinking out loud. You can't take pictures in any activities (I think you used to be able to take pictures in missions but they never saved) - I tried this idea ages ago in a GTA race. Sadly it doesn't work. Also you gotta keep in mind that if someone picks a bad truck they'll want to change one and in races you can't switch vehicles. The only good thing about a Content Creator race is the ability to repair your truck free of charge and the host can lay down a track instead of finding it on the fly. I get what you meant, though, and is a great idea. I'm sure steve will think about it for a meet that doesn't really require pictures and everyone there knows to pick a truck that could take on any terrain/specific terrain. race with markers would make it a lot easier to follow a route . But with the meets now i spend 2-3 days scouting routes so i know a ruff plan of were we are going. and hopefully i have found some good challenges and picture spots and places for other events. Good points all round man, cheers. 2nd full around Los Santos Challenge. 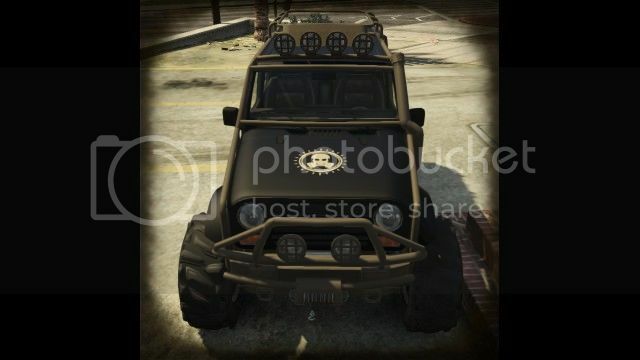 It purpose is to show off the 4x4's you will be using before the main event. get moding your 4x4's now . Please post your gamer tags : I will be starting the list. Previous entrants and category winners will get priority. we will be having an awards show, your chance to show off all your off road vehicles. best dressed driver of the night. and the newbies show case. we will finish off with some jumps, free-roaming and off road climbs around vinewood. Fridays event will be the full around Los Santos Challenge. we will start by the lifeguard station at Vespucci beach, and head out around the map in a clockwise direction. the challenge is to make it around as close to the coast as we can. It takes some time so there will be space for other to join part way though. I will be traveling some of the way by 4x4 and helicopter to get some shots. If you don't make it on the list don't worry the event is long and people tend to drop out, have to go bed, run out of money etc ...... When some one drops out I will invite the next person on the list this keeps things fresh and fun. But I can't do this unless you submit me a friend request. I'd love to come along however i'm a total newby. I'm available for tonight though if its still on. As a follow up. I've found the Sandking suspension set to 'Sports' (middle setting) seems to be a good compromise between bounce and clearance. Can anyone create a signature for me ?? What kind do you have in mind? Here you can find people with skill and who do mainly avatars, signatures, logos, etc. Had a past signature done there.